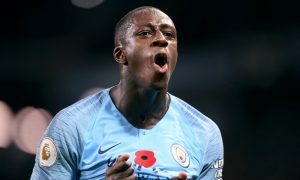 Benjamin Mendy continues his long and slow recovery from a season-shattering injury that saw him rupture the anterior cruciate ligament in his right knee in September. The French international was Manchester City’s most expensive buy of last summer, signed for an initial fee of £49.4million from AS Monaco, and he showed plenty of promise in his early matches before injury struck. Since being sidelined, the 23-year-old has kept fans entertained on social media while posting regular videos and images of his road to recovery. And speaking to the microphones of beIN SPORTS on Thursday, Mendy gave a progress report and sounded more than confident of returning before the season ends. “I’m getting better, I’m in full rehabilitation,” said Mendy, who was in London for an NBA match between the Philadelphia 76ers and Boston Celtics. Mendy is hoping to return in April and hopes to be fit and available to represent France at the 2018 World Cup, which runs from June 14 to July 15.